What do Edgar Allan Poe, Betsy Ross and Kobe Bryant have in common? All made Philadelphia their home in their contribution to the arts, science and sports. They are just a few of the 100's of personalities to learn about on a 2-day trip from Boston South Station to Philadelphia including round-trip train tickets, a hop-on hop-off bus tour, lunch, and centrally located overnight accommodation. So grab your family and join this adventure! Philadelphia, the City of Brotherly Love, welcomes you!. Depart on the early train from Boston South Station to Philadelphia's 30th Street station, just blocks away from some of the most iconic historic sites in America. Join an included hop-on hop-off tour for access to many points of interest in and around the city. 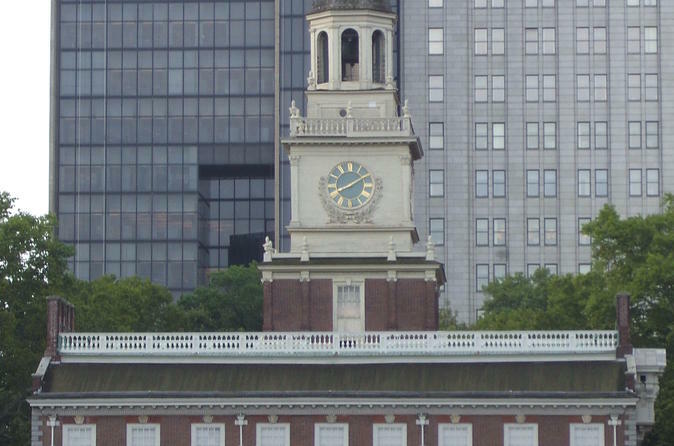 Visit Independence Hall, Liberty Bell, Carpenter House, and other historic sites. You may even visit some of the wonderful museums in the area including the new National Constitution Center and the new National Museum of American Jewish History. Some of the oldest churches and synagogues are in the historic area as well. If history isn't your thing, visit the famous Eastern State Penitentiary, the Simeone Foundation Automobile Museum, the famed Barnes Foundation museum and so much more. Take a load off your feet for an hour or two with an included 2-course lunch at the Hard Rock cafe with priority seating. Rest in a centrally located hotel in Philadelphia and continue enjoying your tour and fun of Philadelphia. After 2 days of shopping, dining and sightseeing, walk around historic 30th Street rail station and enjoy some coffee and pastries before your relaxing rail trip back to Boston South Station.